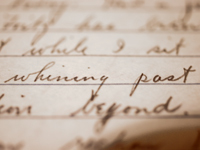 Whining Past is an experiment in historical documentation. It is the transcription of a journal kept by Captain Raymond Earl Hill of the U.S. 365th Infantry Regiment during his service in World War I. The journal recounts Captain Hill’s entire experience in France—from his arrival in June 1918, through the armistice of November 1918, to his return to the States in January 1919. For much of the past year, I’ve been transcribing this fragile, century-old document so that friends, family, and general history geeks can read, first-hand, the experience of Capt. Hill, my great-grandfather. Despite this horror, Cap belied not a whit of the physical or emotional toll such an experience musthave taken—not to my grandfather, not to my mother, and most of all not to the journal that was his record.